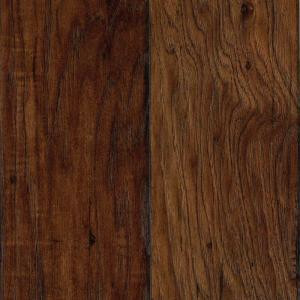 The look of Home Decorators Collection Espresso Pecan 8 mm Thick x 6-1/8 in. Wide x 54-11/32 in. Length Laminate Flooring (23.17 sq. ft. / case) brings a new glow to any home. This beautiful laminate flooring offers a visual of clean, delicate lines while maintaining tremendous durability. The variation between light and warm color tones creates an open and spacious effect in even the smallest room. Impeccable surface detail mirrors natural patterns of the wood grain, giving the resemblance of traditional hardwood flooring. The state of the art glue less locking system makes for an easy installation solution with a no mess installation method that allows you to install in a day and walk on it immediately. The ease of maintenance allows you to spend less time cleaning and more time enjoying your floor. CARB phase II compliant. 23.17 sq. ft. per case. Case quantity: 10. Case weight: 34.25 lb. Buy online Home Decorators Collection Espresso Pecan 8 mm Thick x 6-1/8 in. Wide x 54-11/32 in. Length Laminate Flooring (23.17 sq. ft. / case) HDC601, leave review and share Your friends.